The Vaja cases I’ve had the luck to use are luxurious cases made of beautiful leather. They are usually customizable with your color of choice and often with your choice of leather. This iPhone X case allows you to choose from floater leather, with mixed tanning method resulting in a strong, grainy leather in a variety of bright colors; or bridge leather, with vegetable tanning method resulting in a delicate, soft-touch leather in earthy tones. Both choices include a premium leather lining. The phone is held in a hard, polycarbonate shell that is Qi charging-compatible. The front cover has four RFID-shielded card slots and an extra compartment for folded currency. Sterling silver (925) accents along the sides of the case add a beautiful accent; choose from the simple Argento band, crosshatched Neo design, or the sinuous Barhein design. Prices start at $289.00, and hand-crafting the case takes 25 days. 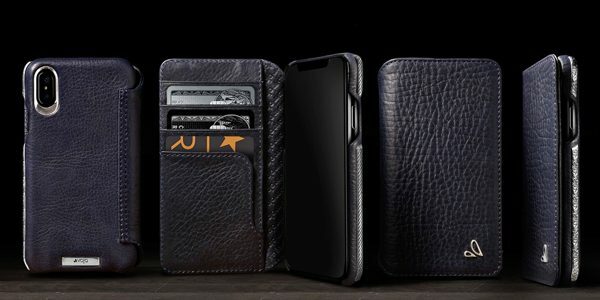 The Customizable Silver Wallet iPhone X Leather Case is available at Vaja. Wow, I didn’t realize Vaja was still around. I bought some really nice cases from them back in the days of my Palm V & Toshiba Pocket PC.